Social Studies 9 2018 - Mr. Goldsack Room 233 In our classroom everyone is expected to think! Mr. Goldsack Room 233 In our classroom everyone is expected to think! Please begin by recognizing and acknowledging the Semiahmoo, Matsqui, Katzie, and Kwantlen Nations on whose traditional unceded territories where we live and we learn. Friendly Advice...start critical thinking!!! Stop wasting time in class! Telling me what I told you will not get you credit for anything. Thanks for listening, but I need you to "think" and learn on your own (with my help and the help of your peers...remember, we're in this together! New ideas and ideologies profoundly influence societies and events. Power alters the balance of relationships between individuals and between societies. Collective (cultural/social) identity is constructed and can change over time. ​Make the First Nations disappear. 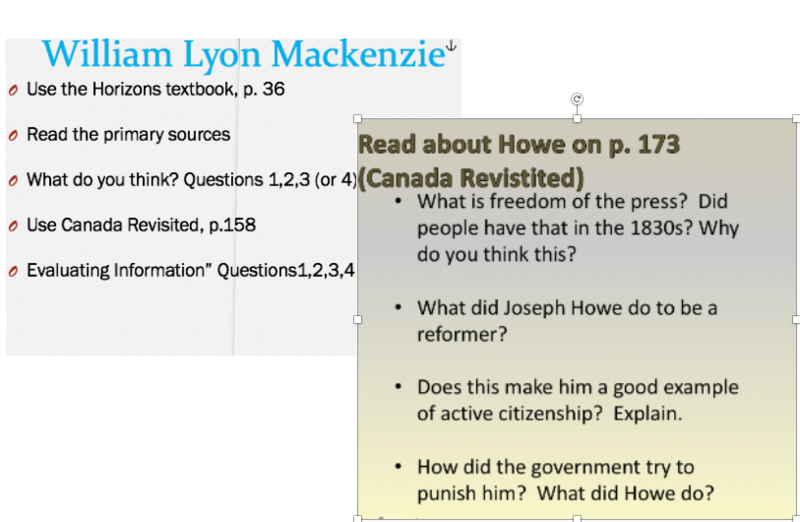 Primary and Secondary sources are important...Analyze and Interpret! interpret (what do you think it means). Each person may see something different, and maybe interpret things differently compared to others...this is a good thing!! When we share our ideas, we may learn more, and have a deeper understanding. September 17... what does it mean to industrialize? What is an Industrial Revolution? Are all revolutions the same? The Industrial Revolution represents a shift from an economy based on agriculture and hand-powered craft, to an economy based on manufacturing involving machines and factories. These changes totally and forever changed how people lived, worked, shopped, ate and interacted with one another. Wherever industrialization spread, revolutionary change followed. Create a Mind Map that shows how the industrial revolution led to change and how those changes led to more changes! Make an effort to show how the changes impacted our modern world. November 27...Welcome back Blocks C and D! Let's start thinking about change in America...go back to a time when there were no colonies (British) in America. 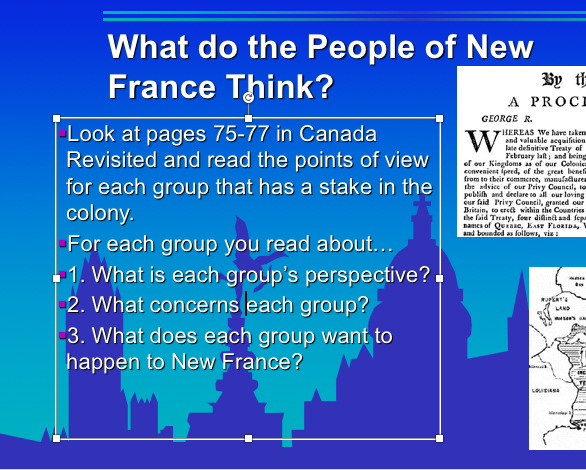 Students learned about life in England during the 1550-1600, and thought about why people came to America...in groups, students chose a leader (governor) and began thinking about the difficulty in creating a "new" place to live and work...as a class, students will be creating a colony together... Soon it will be time for change! - Where is your colony located? – What is the average weather like during the four major seasons in that region? -How will you prepare your colonists for the weather? Does the weather compare to England? -How will food be stored? – What is your colony’s economic activity to repay the joint stockholders? (If you choose the backcountry – how do you survive without imports from Europe? -This must be based on your colony location! December 3-7...students learned about the development of the 13 original colonies in America...Why, where, who, when....individually, students were asked to think about where they would have liked to start a colony. First, investigate the climate in the area they choose, next think about what colonists would have needed to be successful (to survive, to prosper, and to keep the investors in England happy). Dec. 10-15...students will bring their research back to their groups and share their individual ideas about the where and what of their proposed colony...please submit (hand in) your written task for this part of the project! 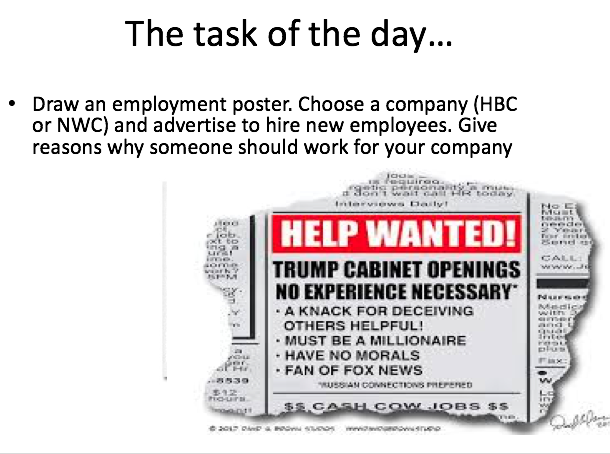 During the first part they were asked to look for potential "propaganda" or bias, or write down any questions they might have. This was to be handed in at the end of class. The second part of the video dealt with the reality of life in the colonies...did the information in the video match what we've learned so far??? Well, I learned that farming was not that profitable at first (downright impossible). Colonist needed help from the local indigenous people to plant, grow, harvest, and process corn. By the way, corn was unknown in England and therefore of little value there...however, native people were willing to trade furs for corn, and furs were valuable in England! The last part of this unit involves students writing a letter to the King asking for a Royal Charter to start a new colony. Jan.14/15...students explored the cause and consequence of the Seven Years War in North America. 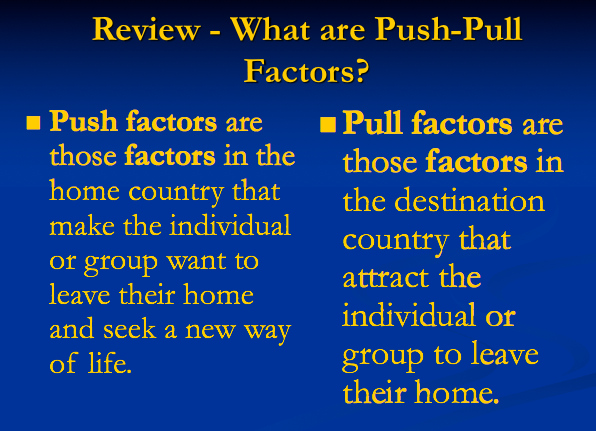 Using the chart supplied (taken from the following ppt) they were expected to identify the perspectives of each group involved, and explain the consequence of this perspective...remember the core causes of the American revolution so far...Mercantilism, Navigation Acts, Seven Years War...and soon the Royal Proclamation of 1763. Soon the move toward revolution will be upon us! Jan. 16-18...students revised the core cause of the American Revolution - the things that happened well before the Patriots chose to declare war! Jan 21-25...students investigated the use of propaganda as a lead up to the American Revolution...the Boston Massacre was not all the press made it out to be, but it did work to bring together the patriots...the king continued his efforts to control and punish, and the people of America continued to demand "NO TAXATION WITHOUT REPRESENTATION". In other words, the king had the power and the people wanted to shift some of the power in their direction...something the king had no intention of doing. A helpful resource for the above task! 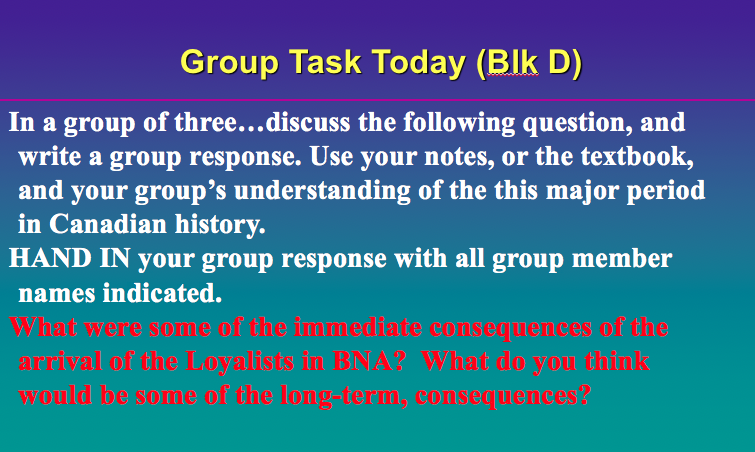 Jan 29-Feb. 1....complete the above assigned tasks! Mar. 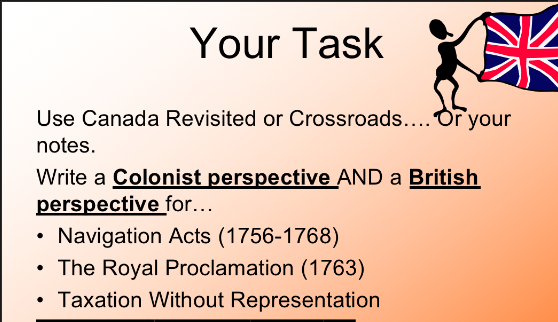 6/7...students examined life in Upper Canada and Lower Canada and created a Reform and Anti-reform table based on what people in the time might have wanted...the task is posted below. 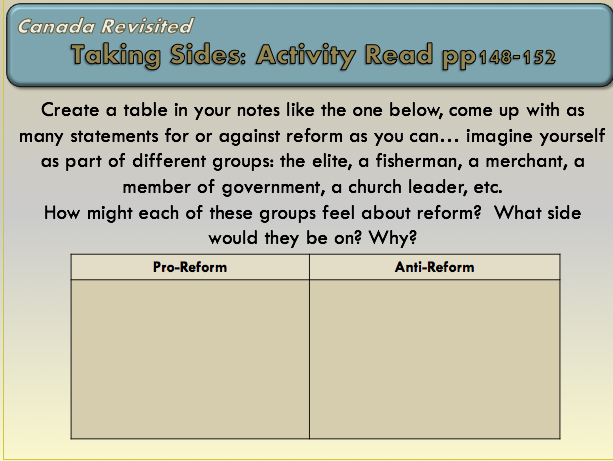 Students are expected to complete the rebellions tasks and begin exploring why the individual colonies needed to join (Confederation). What is NATIONALISM? 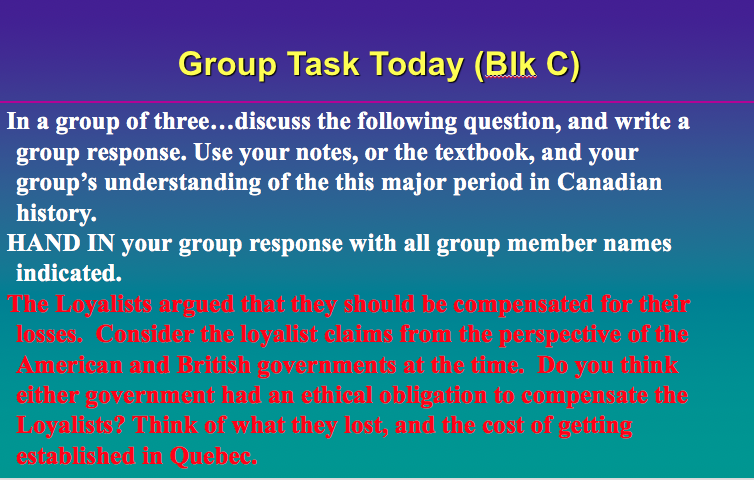 What role does it play in Canada's history (or the world for that matter!)? The Metis have established themselves in the Red River Valley. They farm and hunt bison to make pemmican. They sell the pemmican to the fur trading companies on a large scale....what could possibly go wrong??? Enter Lord Selkirk and his plan the create a colony! 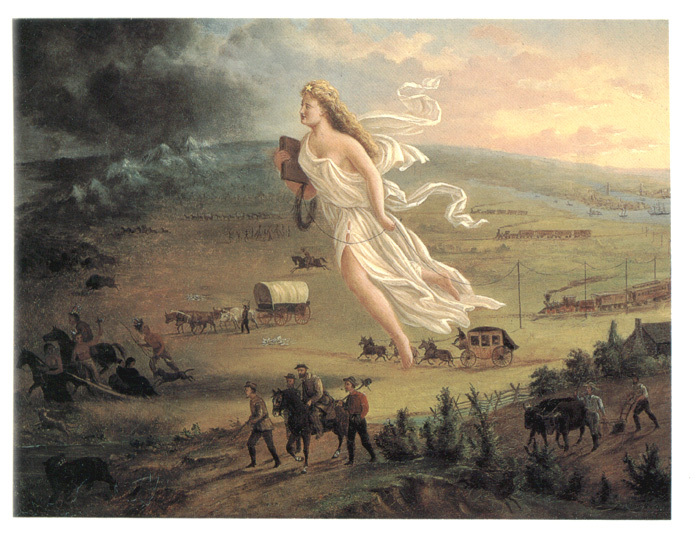 John Pritchard was one of only a few settlers who survived the incident. •the Métis were “obliged to pass” near Lord Selkirk’s settlement and were surprise attacked by the settlers who "fired upon them, twice". •the Métis did not have ammunition or guns however he later describes “those who did have arms returned fire” to defend themselves. This document points to the English settlers for starting the “Battle” of Seven Oaks. His memoirs state; “women and children were running in panic from the approaching enemy, the Métis who were armed. He states that “their hostile purpose being manifest”, they fired the first shot, followed by a "merciless volley". He describes the battle as a “massacre” and the Métis as “murderers” whereas he describes Governor Semple as "being of a mild, steady, just and honourable character, highly accomplished and universally beloved". This version of the story clearly puts the blame on the Métis for beginning the Massacre of Seven Oaks. A letter from John McGillivray dated July 17, 1816 provided details about the Battle of Seven Oaks. In this letter, he states that the “Indians” tried to go past the Hudson’s Bay Post however once observed by Semple, he and his men approached them. It describes how an “Indian” tried to talk to Semple but Semple ordered him to be taken prisoner. As such, the "Indian" tried to escape so "Semple ordered him to be fired at, which they repeatedly did". This document clearly indicates that Semple and his party fired the first shot.